This West Coast blues guitarist conjures SRV, Billy Gibbons, BB, Albert and Freddie, T-Bone, Collins, Johnny Watson and more with unrivaled intensity and groove. Check out these 10 smoking tracks of swinging, rocking r&b. Vancouver based blues guitarist, James ‘Buddy’ Rogers learned to love the blues close to home. His dad Bud who worked for the railroad brought home records and a guitar and by the time little Buddy was 10 he was lifting licks. By 11 his band was gigging and within two years he was a regular at local blues clubs. At 15 his band Texas Storm was being booked by Canada’s top agency for opening concert slots. In 1995 at age 19 he teamed with former BB King bassist Russell Jackson and began a road trip that lasted five years. Based in Kansas City they played an endless string of clubs, concerts and festivals sharing the bill with Canned Heat, Sam Taylor, Holmes Brothers, Elvin Bishop, Kenny Neal, Katie Webster and countless others. In 2000 Buddy started his own band and played blues clubs across Canada and Europe. When he wasn’t working under his own name he appeared on US tours and recordings with many other blues acts including BB King drummer Tony Coleman’s band. His main influences on guitar including Johnny Watson, Jimmie Vaughan and the three Kings, (Albert, Freddie and BB), plus years of roadwork have turned Buddy into one of the most inventive and penetrating blues guitarists performing today. 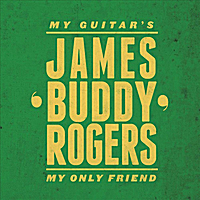 In 2012 he teamed with producer Tom Lavin of Powder Blues to record a CD titled “My Guitar’s My Only Friend” that showcases a guitar and voice forged by a life in the blues. James ‘Buddy’ Rogers; his blues is here to stay.